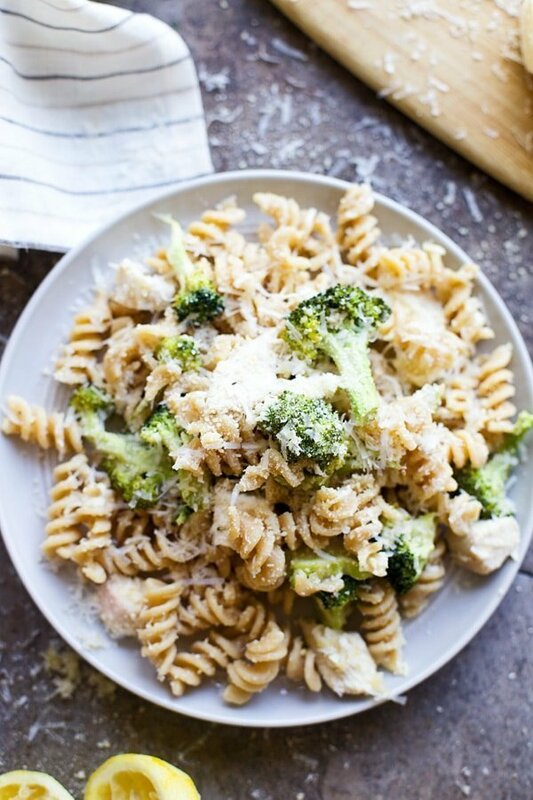 Easy weeknight dinner meets elegant Friday night pasta in this Lemony Roasted Chicken & Broccoli Rotini. 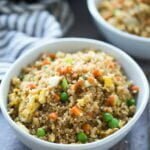 Light, but hearty and oh so delicious! I’ve found my new favorite way to eat pasta (besides this, this and this) and it couldn’t be easier. 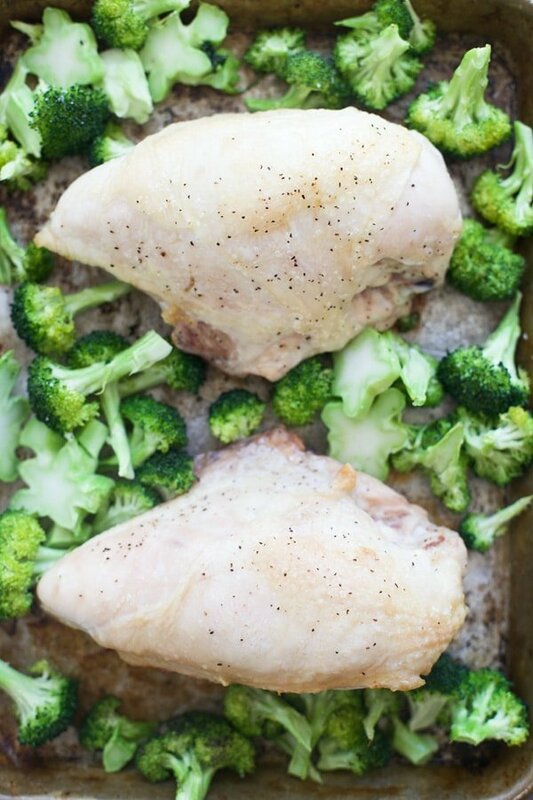 Here’s how it goes: Roast chicken & broccoli. Boil pasta. Cover in parmesan cheese. 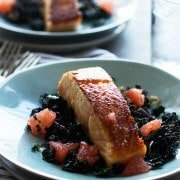 Toss in a no-cook lemon vinaigrette. Serve. Ok, so that’s the very condensed version. Let me delve in a little bit deeper. I was watching The Barefoot Contessa the other morning, and like she often does, she had an entire show devoted to roasting chicken, and as a perpetual chicken lover, I was all in. She roasted whole chickens, whipped up crispy chicken paillard (crispy chicken), and cooked up chicken livers, but the part that stuck with me the most was the simplest preparation of all – bone-in, skin-on roasted chicken breasts. 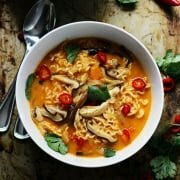 At its core, it was just an ordinary chicken breast, but she suggested several ways to use it after cooking, and it got the wheels in my head turning with all the different ways I could use it as well. I piggybacked her idea of a tossing the roasted chicken with some broccoli and pasta, and took it a step further. Instead of roasting the chicken breasts on their own, about halfway through cooking, I surrounded them with a whole head of chopped broccoli tossed in some olive oil, salt and pepper and let them roast together. Two birds, one stone (and one pan). 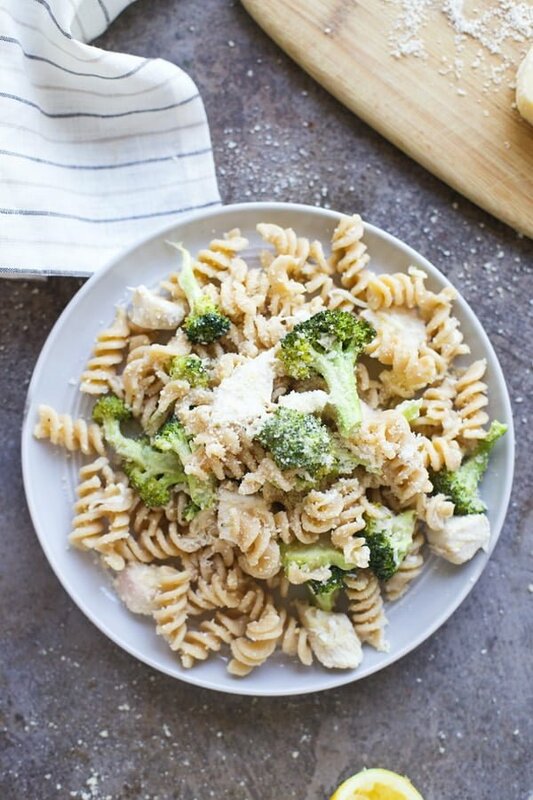 Instead of throwing a creamy sauce together and dirtying up another pan, I decided to toss the cooked pasta, chicken and broccoli in a super simple lemon vinaigrette, and now it’s the only way I want to eat pasta for the rest of the summer. 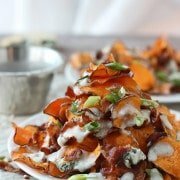 For one, it’s light, two it’s incredibly flavorful, and three, it’s stupid easy. Before tossing the hot ingredients with the vinaigrette, I like to toss the pasta with the grated parmesan cheese, a trick I learned from Giada (think I watch the Food Network enough??) to help the sauce adhere to the pasta twirls. I also like to save a good amount of the starchy cooking liquid to create a more sauce-like consistency and velvety texture – a finishing touch I put on just about all of my pasta recipes. The beauty of this pasta, is it’s totally versatile. If you happen to have zucchini, asparagus, or even cherry tomatoes on hand instead, you can easily swap them out. Same goes for the cheese – don’t have parmesan? 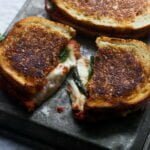 You can use asiago, pecorino, or even a sharp cheddar cheese. While I served this hot, it’s equally as delicious served room temperature, or even cold the next day. Enjoy. Toss broccoli with 2 teaspoons olive oil and ¼ teaspoon salt. When chicken has about 15 minutes left, pull the chicken out and scatter broccoli around. Bake until chicken is done cooking and broccoli is bright green. When the chicken is done cooking, let rest for 5 minutes, then cut into bite-sized pieces or shred. While the chicken cooks, bring a large pot of water to a rolling boil. Season with salt. It should taste as salty as sea water. When there is about 8 minutes left for the chicken to cook. Add pasta. Stir. While the pasta cooks, add lemon zest, garlic, lemon juice and remaining salt together in a large bowl. When the pasta is done cooking, immediately transfer to bowl using a sieve, reserve cooking liquid. 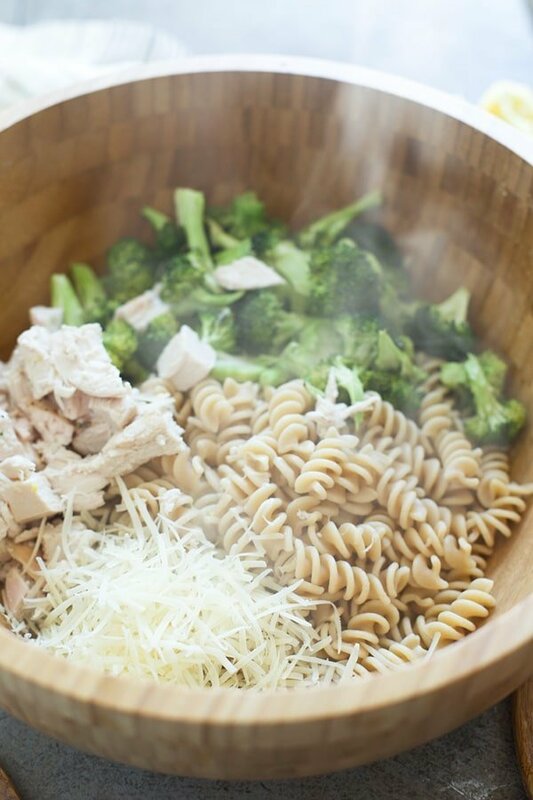 Add chicken, broccoli, parmesan and ¼ cup of pasta water. Toss together. (The heat of the pasta and water will cook the garlic and create a sauce.) If necessary, add more pasta water. Season to taste with salt and pepper and garnish with more grated parmesan cheese. 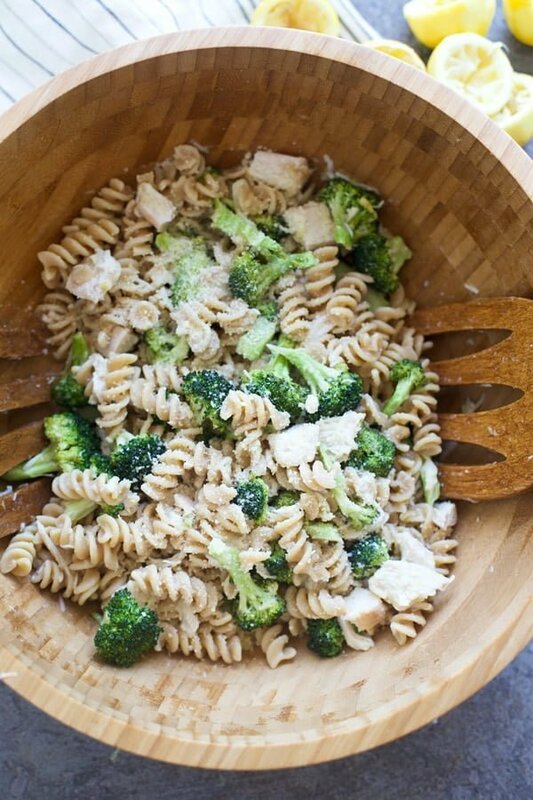 7 Responses to "Lemony Roasted Chicken & Broccoli Rotini"
How do I print the recipe? 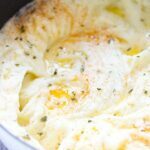 There is a little print button in the top right corner of the recipe, just click that!